This post was written for the UCL Big Question Debate on the UK General Election 2015. The financial crises and recession that began in 2008 were initially viewed as an opportunity for rebalancing the UK economy away from financial services towards a broader base, and addressing Britain’s long term north-south divide. 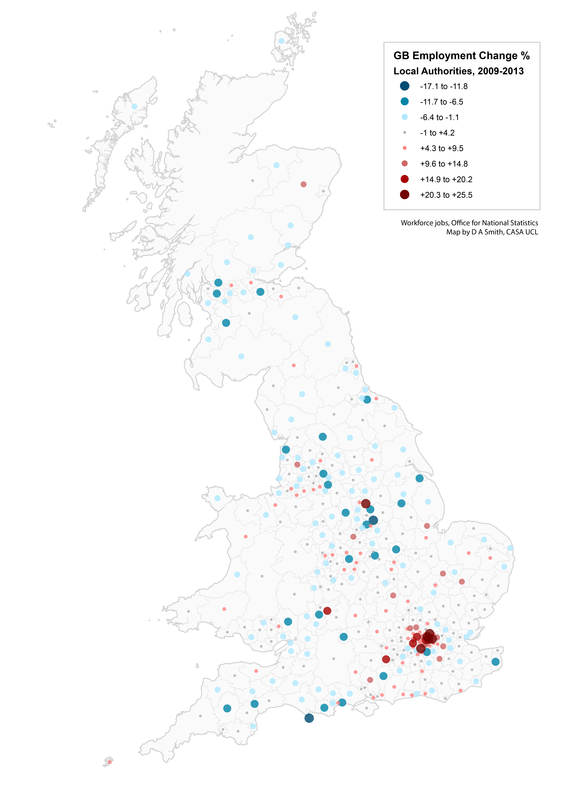 In reality however the post-recession period has seen a strengthening of regional divisions with high rates of growth in London and much of the South East, compared to mixed or negative performance in the rest of Britain (see the map below). While the South East now needs to tackle the knock-on effects of growth in terms of the severe housing shortage, many regions in the UK have been struggling to achieve growth at all. City devolution policies are aimed at boosting growth in northern cities and narrowing regional disparities. The 2015 general election is unique for the prominence of these policies, with devolution manifesto commitments from all the major parties. The Conservatives would continue their programme of devolving some powers and budgets to specific northern cities, while Labour and the Lib Dems would legislate for more comprehensive city devolution. Are these policies likely to work? There is currently much debate and uncertainty over this question. I argue here that urban research can help us understand current trends in cities and the directions urban futures are likely to take. Firstly we need to understand the continuing structural changes in the economy. 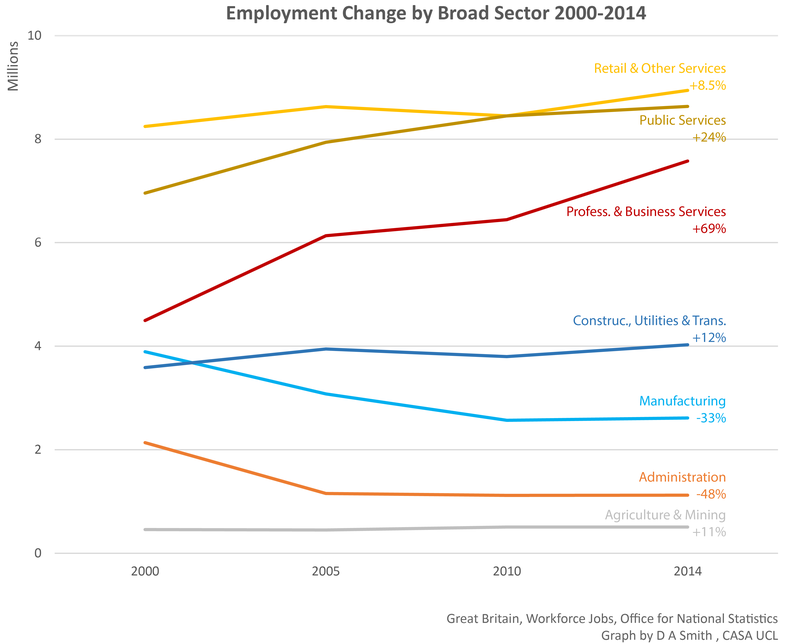 Economic growth is being led by professional and business service jobs, so-called ‘knowledge economy’ sectors (see graph below). Despite zero growth in financial services jobs over the last 15 years, professional and business services continue to grow substantially led by sectors such as ICT, management consultancy, creative industries, legal and real estate. Other service sectors are more mixed, with a decline in administrative jobs, and some growth in retail and public services. Meanwhile manufacturing continues to be in decline, though has levelled off in the last five years. The economic picture illustrated above is one that significantly favours cities and city-regions. Knowledge economy firms benefit from clustering together, sharing labour markets, knowledge spill-overs and other externalities. These agglomeration economies are strongest in cities, and strongest of all in large cities, where the density of transport and communications infrastructure facilitates connections and reduces costs. An expanding academic literature describes how larger cities are on average more innovative, competitive, diverse and sustainable, backed up with empirical evidence mostly from the USA. This line of reasoning chimes with the strong economic performance of London in the UK, and explains how the capital has been able to bounce back from the recession through its diverse economic base. Yet in research at the Centre for Advanced Spatial Analysis (CASA) we have found that the relationship between city size and economic performance does not hold for Great Britain (see paper). Several small cities are the fastest growing in the country and have become highly specialised in knowledge economy industries, principally cities/towns in the South East with universities such as Milton Keynes, Cambridge and Brighton. Meanwhile the major post-industrial cities, such as Birmingham, Manchester, Liverpool, Leeds and Newcastle are underperforming given their relatively large size. Are these northern cities capable of faster growth and developing stronger knowledge economy clusters? Recent regeneration in cities such as Manchester would suggest yes, and indeed some green shoots can be seen in the North West and West Midlands in the map above (these two regions are the fastest growing from 2010-2014 after London). Such regeneration does however require significant investment, planning and political collaboration. Thus this is where devolution policies come in. The intention is to give cities more powers for strategic planning, housing, transport and local budgets. More comprehensive devolution proposals allow cities to retain money raised by local taxation. At present the city with by far the most devolved powers is London, with the creation of the mayor and Greater London Authority having positive impacts on development over the last 15 years and helping attract infrastructure spending towards the capital (indeed to an unfair extent- there is a huge UK public investment bias towards London). Would devolution allow other large cities to repeat London’s success, or would fiscal devolution favour existing affluent cities and exacerbate divisions? Many of these issues around the future of UK cities are being discussed by the Foresight Future of Cities project which UCL is significantly involved in. You can read current Foresight working papers exploring this and many other current urban debates here. We also have a new CASA paper investigating the fracturing political geography of Great Britain.